There are building materials, the universality of which allows their use in almost any area of ​​production. The same must be said about plywood. Ease, durability, budget and environmental friendliness of this material have no equal, which makes plywood an indispensable element for construction and other fields of activity. The most widely used plywood sheets are used for laying a subfloor, while they can be used both for flooring new surfaces and for repairing old ones. Despite the ease of working with plywood, there are a number of features that must be considered before proceeding to the arrangement of the floor. Plywood is based on a natural material that is highly hygroscopic, wood. That is why plywood is not recommended to be used for arranging flooring in rooms with high humidity. So, the permissible humidity should not exceed 60%. Failure to comply with this rule threatens the rapid separation of the plywood sheet and the failure of the subfloor. Stages for laying the floor. But if necessary, the moisture resistance of plywood can still be improved. For this, a special putty is usually used, based on polyvinyl acetate, known as PVA. The plywood sheet is carefully coated with a solution, first on one side, to achieve the appearance of wet spots on the opposite side, then on the other. After the sheet is completely dry, the treatment must be repeated. As a rule, it takes at least 72 hours to completely dry the material. When the plywood is dry, it can be covered with any antiseptic for wood or use acrylic lacquer, which will give the material additional strength. Such specially treated plywood sheets can be used for flooring in a room where humidity reaches 78%. Before you begin to decorate the floor, you must make the plywood in the room and give it time to acclimatize. 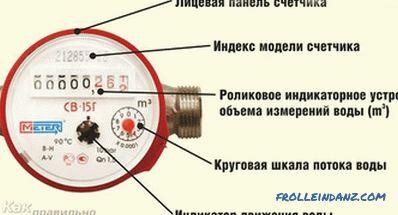 For example, in an apartment or other permanently heated room, the acclimatization period should be about 24 hours, in a warehouse - at least 72 hours, and in an unheated room - about 7 days. Before laying the material is kept in a horizontal position, while it is desirable to lay it in the foot. 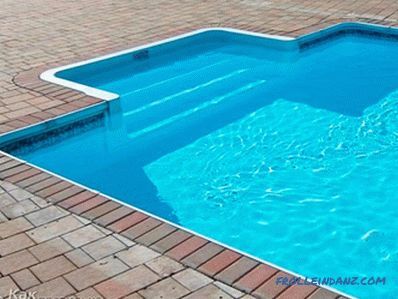 The algorithm of the work depends entirely on the type of foundation and on the method of laying the floor. But regardless of the material from which the base floor is made, it must be checked for the evaporation of the liquid. 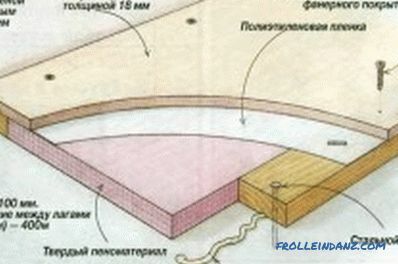 Schematic design of the subfloor on logs. The base of the floor is covered with a film in such a way that the center of the film is slightly raised and the ends are pinned by rails. The condition of the base under the film indicates whether plywood sheets can be used for arranging the subfloor. For 24 hours, the inside of the film is fogging, this indicates a high percentage of moisture evaporation from the base. Plywood for laying the floor should not be used. Small drops appeared under the film after 72 hours - a concrete floor is required to be covered with plastic film or glassine, and the wooden base must be disassembled. In this case, it is required to use plywood processed by PVA, but even it will not last more than 10 years. The condensate did not appear for 5 days - plywood sheets can be laid in any desired way. Plywood base on a screed. When all the preparatory activities have been carried out, you can begin laying the material on the substrate. 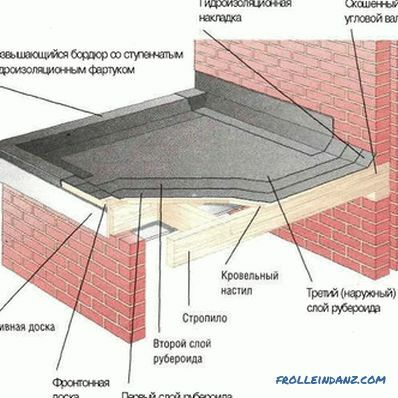 The list of materials and tools that will be required for the work depends entirely on the type of foundation. If we talk about laying the floor on concrete, this can be done in two ways: by screed and on logs. The first method is used in the case when the base is sufficiently even and smooth, and plastic materials (cork, linoleum, etc.) will be used as a topcoat. self-tapping screws in dowels 5x60 mm. Before laying the floor, sweep the base thoroughly and vacuum it. Then it is covered with a layer of bitumen varnish, which must first be diluted with kerosene in a ratio of 1: 5.Processing is required when the windows are open and the power is turned off in the panel. Plywood with a thickness of 8 to 18 mm is cut into strips or squares with the help of a saw and laid out. There should be no matching stitches. Along the perimeter of the room between the draft floor and the walls there should be a gap of at least 2-3 cm. If the floor is placed under the topcoat of linoleum or cork, plywood should be glued to the base with bustilat or parquet mastic. Mounting slots do not need to leave. 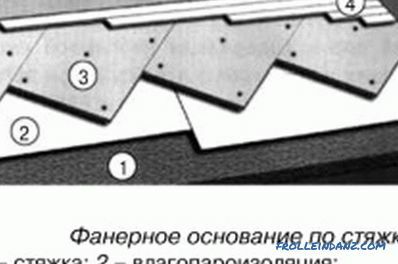 In the case of laying an oak or other parquet on a plywood, the sub floor must be secured with self-tapping screws, while leaving the mounting slots of 2 to 3 mm in size. Plywood is drilled using a square-shaped drill - holes in the corners, in the center and in the middle of the diagonals. The central holes should be offset 1/4 of the width of the sheet. The sheet is removed and the holes in the base are drilled using the marks obtained. Dowels are driven into the holes. Glue is applied to the base with a spatula, plywood is laid and it is fastened with self-tapping screws. The heads of the screws should be sunk in plywood. 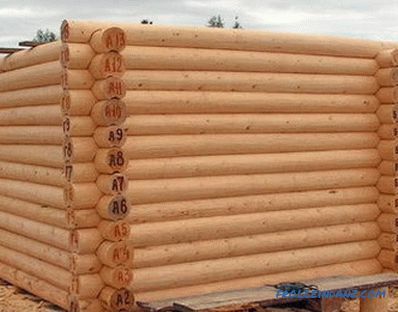 Layout of plywood for logs. First the crate is equipped from the board. On the prepared by the above method, the base is mounted frame. Boards are fastened between themselves with nails or screws. The pitch of the batten should be from 30 to 60 cm, all ends of plywood sheets or strips should fall on logs. 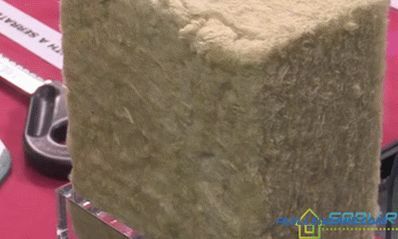 The resulting sections of the batten are filled with any insulating material, except for mineral wool, which can cause irritation of the respiratory system. 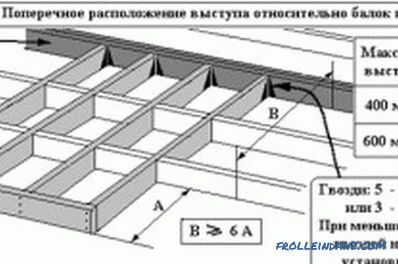 Then plywood is laid on top, the gap between plywood and walls should be at least 2 cm, and between sheets - about 2-3 mm. 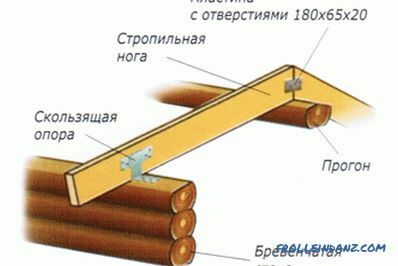 Mounting plywood to logs must be done either with glue "liquid nails" or nails. With the help of plywood, you can successfully repair a wooden floor on which the finish will subsequently be laid. In this case, cutting plywood sheets is not required. Laying is made by integral elements, beginning from doors. 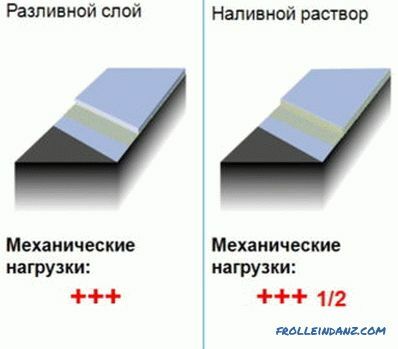 The thickness of the material should be at least 1.2 cm. 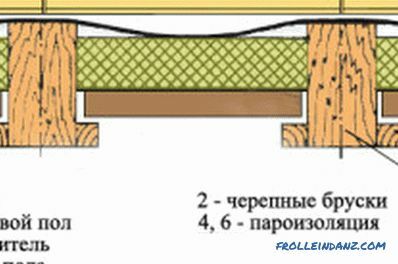 When installing, a gap of 2-3 cm is left between the sheets and the walls, but there should be no gaps between the plywood itself. Plywood fastens on liquid nails, bustilat or any other joiner's glue. It is also necessary to smear with glue and the ends of each sheet. Any finished covering can be laid on the prepared rough plywood floor. A plywood floor can be an excellent solution for arranging flooring in a city apartment or in a country house. Here you only need to remember one thing - in no case should you lay the plywood on a wet base, as this will quickly lead to rotting of the material and the need to replace the flooring.